Energy from the Earth! What could be more natural or plentiful? 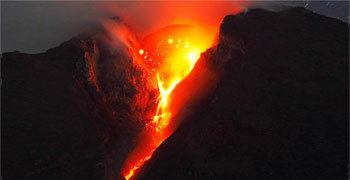 The source of geothermal power is the heat contained inside the Earth; heat so intense that it creates molten magma. "The huge reservoir of volcanic energy represented by the heat of rocks and gases could undoubtedly be tapped in many places and used for power production. I believe that in time to come the greatest of all sources of power will be found in the subterranean storehouses of volcanic regions, where the internal heat of the earth can be reached at a relatively shallow level. The limited supplies of coal and oil in the earth will be exhausted in the comparatively near future. The water power available in rivers is already to a large extent taken up. Water–power from the tides will probably prove costly to utilize, and the same is likely to be true of any method now in sight of using direct solar energy. On the other hand, no insurmountable obstacles seem to exist to tapping the earth&apos;s internal heat on a vast scale, and volcanology is paving the way to this accomplishment". 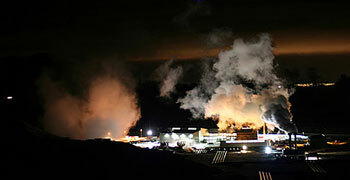 Geothermal power Geothermal power is power generated from the heat within the earth. The heat in the earth heats up aquifers of water within the crust and the resulting steam is tapped to run turbines that then generate electricity. Geothermal literally means Earth&apos;s heat. The word geothermal comes from the Greek words "geo", meaning earth and "therme", meaning heat. Geothermal heat is generated from within the earth's core, some 4,000 miles below the surface. Geothermal power or Geothermal electricity is the electricity generated from the Geothermal energy. The heat is produced mainly by the slow decay of radioactive materials such as uranium and potassium found in the various materials that make up the earth's interior. The amount of heat energy contained within 10,000 meters (about 33,000 feet) of Earth's surface is 50,000 times more than all the oil and natural gas resources in the world. 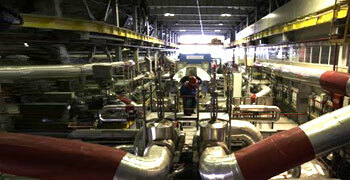 Modern technologies include dry and flash steam power plants, etc. Geothermal power is generated in 24 countries today. Major amount of Geothermal power is produced in United Nations. Geothermal power is also initiated by countries like India, Philippines etc. Working of Geothermal power plant Geothermal power plants get energy from hot lava inside the Earth. The heat is used to boil water and get vapors. 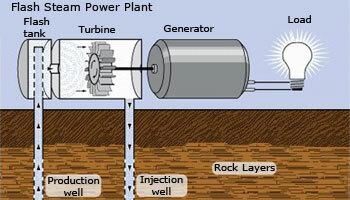 Vapors run the turbine which is coupled to a generator which produces electricity. The heated water in the crust would be converted to steam. Holes are made to reach the hot region where the steam is produced. Pipes are laid to get the steam and purify it and use it to rotate turbines of electric generators. 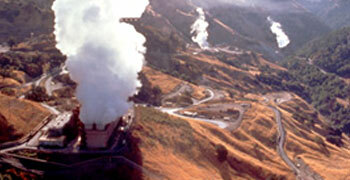 The first Geothermal power station was built in Italy, at Landrello in 1904. Later it was built in New Zealand, Iceland, United Nations, etc. The Geothermal power station often sends cold water in to the hot areas where the steam is produced from one side and on the other side it collects the hot steam. Cold water is first pumped down an "injection well", which goes through the hot region of rocks and it is made to come back using the "recovery or production well" which works under pressure. This hot water at high temperatures flashes in to steam as it reaches the surface of the Earth. Later, this steam is used to run a turbo generator. Despite the fact that geothermal energy is renewable, and able to reduce our dependence on imported fuels, the fact remains that fields of sufficient quality to produce economic electricity are rare. 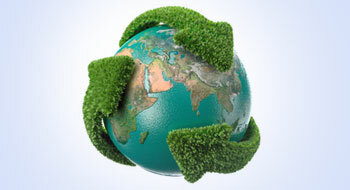 Geothermal energy is a renewable energy, which can be used practically for ever. However, the Geothermal power plant uses the heat that is produced only in one particular area. So after a few years the heat may get reduced and so the steam may not be produced. Hence it is required for the power plant to shut down for few years until the heat is regained in that region. Geothermal Energy is self renewing and its capacity is unlimited theoretically. If this resource is not managed properly it may lead to a doubt, whether geothermal energy is renewable or non&dash;renewable. Proper managing of this resource is the major concern to make it renewable all the time. Flash Steam Power Plant These are the most common form of geothermal power plants. The hot water is pumped under great pressure to the surface. When it reaches the surface, the pressure is reduced and as a result some of the water changes to steam. This produces a ‘blast’ of steam. The cooled water is returned to the reservoir to be heated by geothermal rocks again. There are three basic types of Geothermal power plants: (i) Flash Steam (ii) Binary Cycle (iii) Dry Steam. All these three types of power plants replenish the reservoir by injecting the used geothermal fluid back in to the ground and recycling the hot water. A cooling system is very much required for any operation of a geothermal power plant. These cooling systems prevent the power plant from over heating. There are two types of cooling systems: Water cooled and air cooled systems. 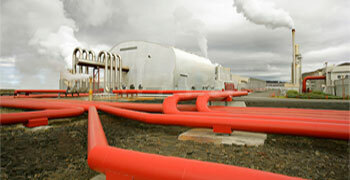 This type of Geothermal power plants are most common in modern days. They use water cooling systems. The steam produced would be around 360° F. Water boiling at STP (Standard Temperature and Pressure) flows upwards through the wells under its own pressure. As the water is pumped from the reservoir to the power plant, there would be drop in pressure, which causes the water to convert in to steam which is collected in to a steam vessel and it would rotate the turbine of a generator. These plants emit small amounts of steam, and the leftover condensed steam and water would be brought back in to the reservoir for reuse. In a binary cycle power plant, the heat from geothermal water is used to vaporize a "working fluid" in separate adjacent pipes. The vapor, like steam, powers the turbine generator. This type of power plants are made to produce electricity in most economical way. The emission rates of this power plants are ZERO. It has a binary process (binary means two) where the geothermal water is used to heat another liquid such as isobutene, which has a lower boiling point than water. The heat is exchanged between the two liquids in an efficient way using heat exchanger. The secondary fluid is turned in to vapour by absorbing the heat from the primary liquid. This steam is used to rotate the turbines. This uses air cooling instead of water cooling and hence it is emission free. 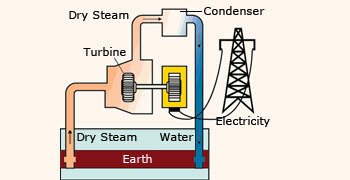 The steam goes directly to a turbine, which drives a generator that produces electricity. The Geysers is a complex of 22 geothermal power plants, drawing steam from more than 350 wells, located in the Mayacamas Mountains 116 km north of San Francisco, California. This type of Geothermal power plants are very rare. They involve dry steam which has a temperature greater than 455°F. This steam is directly pumped from the geothermal reservoir to run the turbines that generate power. These power plants need steam in huge amounts and the emission of gases is minimal. The block diagram of a dry steam power plant is shown in the figure at the top. This is the oldest type of geothermal power plant. It was first used at Lardarello in Italy in 1904. Steam technology is used today at ‘The Geysers’ in northern California, the world's largest single source of geothermal electricity. These plants emit only excess steam and very minor amounts of gases. Refer to the image at the bottom. Geothermal Energy is utilized in many parts of the world. Most of the Geothermal power comes from the United States. There are some other places like Atlantic coast, Texas, etc, which do produce considerable amount of Geothermal power. The initial construction costs for geothermal power plants are high because geothermal wells and power plants must be constructed at the same time. Over the time the cost of production of electricity becomes less, as the availability of the fuel becomes predictable. The power plant literally sits on top of its fuel source. So there would be no transmission of fuel from one place to other. Inside a Geothermal Power Plant By far, it is non-polluting and environment friendly. There is no wastage or generation of by-products. Geothermal power plants don't occupy too much space and thus help in protecting natural environment. They do not burn fuels to generate electricity as do fossil fuel plants. Geothermal power plants release less than one to four percent of the amount of carbon dioxide (CO2) emitted by coal plants. Thus they are environment friendly. They are compatible with many environments. They have been built in deserts, in the middle of crops, and in mountain forests in relatively smaller area. Emission of sulphur compounds Geothermal power plants emit only about one to three percent of the sulfur compounds than the coal and oil–fired power plants do. Geothermal steam and hot water do contain naturally occurring traces of hydrogen sulfide (a gas that smells like rotten eggs) and other gases and chemicals that can be harmful in high concentrations. Geothermal power plants use "scrubber" systems to clean the air of hydrogen sulfide and the other gases. Sometimes the gases are converted into marketable products, such as liquid fertilizer. Newer geothermal power plants can even inject these gases back into the geothermal wells. Emissions of sulfur compounds from motor vehicles and fossil fuel plants are also major contributors to acid rain. Geothermal power plants, on the other hand, emit only about one to three percent of the sulfur compounds that coal and oil–fired power plants do. How ever well–designed binary cycle power plants have no emissions at all.